Sorry, we know that we have not been updating this blog for a while. We were swamped with work and orders after our short break. To make up for our “missing in action”, here’s a lovely craft for those of you who’s itching for some creative outlet. 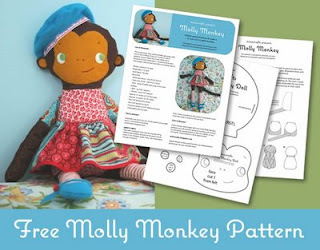 This sewing pattern of super cute monkey named Molly was created by the very talented Larissa Holland of mmmcrafts. She first made this loveable monkey for her youngest daughter’s birthday, and she has been very generous to made it available to download for free! Download pattern here. We’re sure that your little girl will love Molly as much as we do. Do leave us your comments on what you think of Molly. Send us pictures, we would love to share your completed Molly.